Help! Our downtown is dead! What can we do to make it a lively place? That’s the question that we hear most often. And there are lots of ways to answer, lots of things you could try. We’ve decided to coach you through one idea–just one idea–that will work in a town of 500 or could scale up for a town of 50,000. 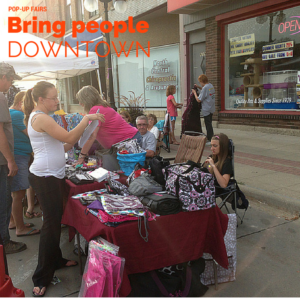 It’s a festival of local businesses, artists, direct marketers, home-based businesses and others who have neat stuff to sell, creating pop-up temporary businesses right on your downtown sidewalks, just for one day! Why call it a pop up? 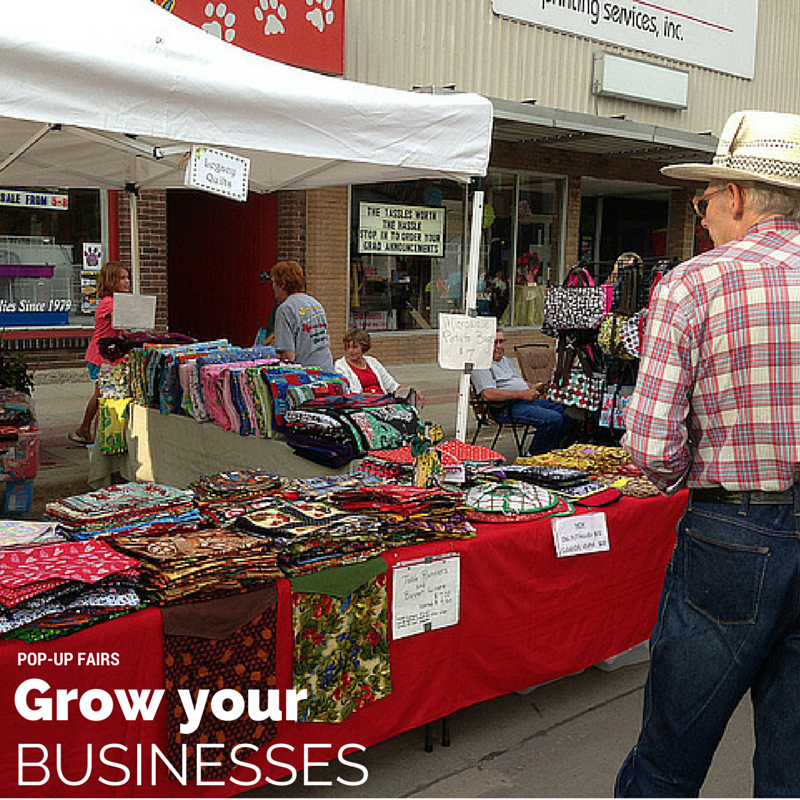 Pop ups are a new and popular idea, but really, we’re talking about a pretty familiar idea. You’ve seen a county fair with business booths, or people setting up business sales tables at local events. This is a fresh take on that old idea. More than just plain old display tables, businesses will create temporary stores–pop-ups–that generate more excitement. Does this work in really small towns, under 1,000 people? Yes, because you’ll focus on the smartest ways to build some excitement with the fewest resources. We’ll coach you with ideas. Even if you can’t figure out how to start this as a big event, DO IT ANYWAY. You need a place to start, and next time it will be bigger. When the snowball starts down the hill, it’s very small. But you have to push it over the edge first! Does this work in larger towns, with 10,000 or more people? Yes, because you’ll get to pick the best section of town to work with, and you’ll have more potential pop-ups to draw on. We’ll coach you with ideas tailored to your resources. Have you already purchased the course? Head to this page to get started. Why this pop-up idea and not some other project? It’s not a hard idea. It’s a temporary, one day in and out, event. It builds enthusiasm. People will get excited and excitement is catching. It brings attention and interest downtown, right where you need it most. 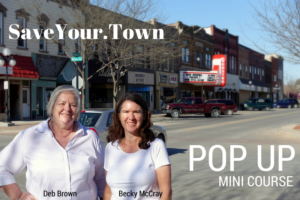 It supports your local businesses you already have, both the downtown businesses and the other businesses that participate as pop-ups. Even if you have no businesses now, it’s a way to give people a first start in business. They can create a pop-up store just for one day, and that might just give them a jump start to a bigger business idea. It works in any size town. So what’s in this mini-course? It’s a lot more than just the idea. You can take the idea for free, just like we’ve described it. In this course, you’re getting the HOW-TO and the focus on IMPLEMENTATION. We’ll be talking you through the process by email. We’ll answer your questions. We’ll help you tackle problems. When you take the course, you have us in your corner. You’ll get a series of lessons over four weeks, walking you through the whole process step by step, and a post-event email in week five. There won’t be any complicated logins or long videos to sit through. You can do them at your own pace, save them for later, or even print them out if you like. However you work best. Can we pull this off in just four weeks? Deb managed to pull of the Tour of Empty Buildings in just four weeks. Becky pulled off a big conference in six weeks. So, yeah, you can do it. Don’t try to do it all alone. We both found a few key people to help out. And don’t try to get everything done. Just focus on getting enough done. There will always be more things you can add next time. This time, just do enough to make it a success. Implementation is the watch word! The idea is worth nothing if you don’t implement it. So we want to coach you through this process from right now until you actually have pop-ups on your sidewalks, all the way through a debrief on what went right. Then the goal is for you to take this success, and build on it with more activity and life for your downtown. Because it’s all about taking your downtown from feeling dead, to being a lively place.